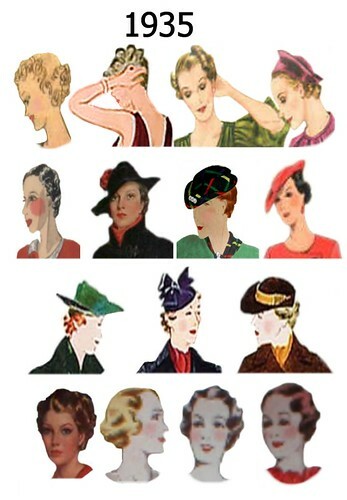 Georgene’s post made me think of them, because I adore that cute little trilby on the right. 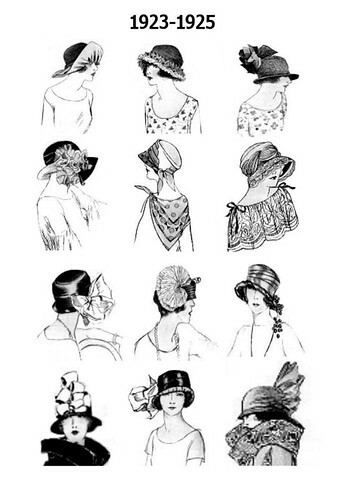 When I was younger, I loved nothing more than playing with my grandmother’s collection of hats on a rainy afternoon, and every time I see a vintage pattern I long for the chance to wear one. What happened to our relationship with hats? 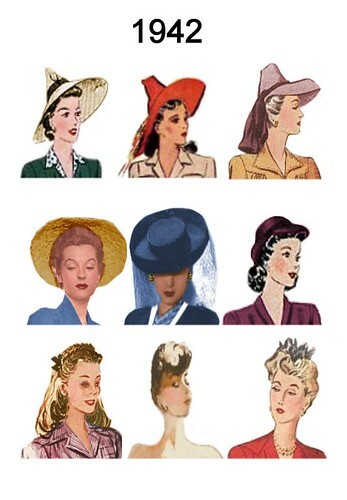 My theory as to why woman no longer wear them boils down to this: we no longer wear hairstyles that accommodate a hat, that is, a style smooth at the back of the head with curls around the face. Bangs do not work with hats (ask me how I know this.) These days our hairstyle is our “head ornament” and I think our increasingly casual lives jsut don’t give us that many opportunities to wear them, and so we don’t know how to wear them anymore. These days when I see a woman in a hat she is just SO selfconscious and aware of what’s on her head. It reminds of me seeing my Episcopal dad in a Yarmulke at my cousin’s Bar Mitzvah. Church. Our African-American sisters in particular really know how to rock this and I salute them for keeping the flame burning, but for the most part hats at church are a thing of the past where I live. The Kentucky Derby. Not an event I’m likely to attend in the near future. Weddings. Well, many of them are evening events now, and hats are kind of a daytime thing if you ask me. Meeting Queen Elizabeth or the Pope. Same as the Kentucky Derby. Not a long list. Plus, a hat is meant to seen, and since most of us drive everywhere, where would we wear hats on a daily basis? The mall? Costco? I can’t envision it. Great hats do exist….. like here….and here…and here. First Lady of France Carla Bruni needs to work on her hat wardrobe a bit; it’s hard to believe she looks more matronly than the Queen, who is twice her age and still wore a better hat. Carla should be channeling Jackie Kennedy. Maybe when my daughters get married I’ll have a chance to wear one. Hopefully they will have day weddings. Here she is – there is not too much to say in addition to the review on PR, except that I added thin shoulder pads because I’m mouse shouldered. One thing I’m still debating is whether or not to add some hand top-stitching on the red side. I have some soft gray silk buttonhole twist that might be nice. Will need to ponder that a bit more. 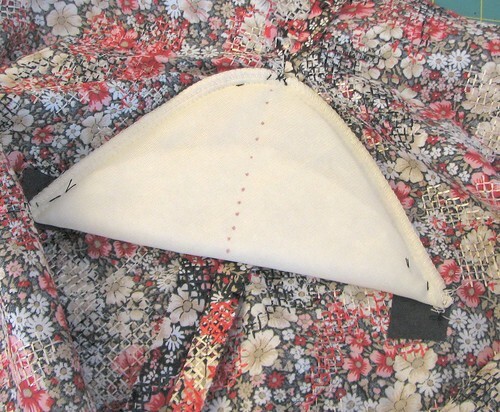 The shoulder pads are stitched to the seam allowance at the shoulder, and tacked to a small pieces of black fusible woven interfacing at the points. These are ready made, and composed of batting instead of foam. I wanted a pad that would drape softly and identically regardless of what side of the jacket I’m wearing. 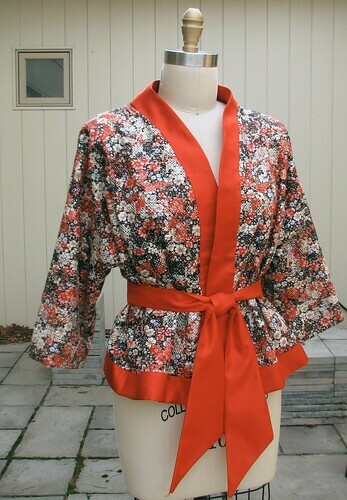 I’m very happy with it – it weighs nothing, and it looks as good loose as it does belted because the silk organza interfacing stiffens the edges just enough to flare the jacket away from my body. My dear daughter’s high school is holding another fashion show this year. The kids are big fans of Project Runway. This is the 3rd year they are putting it on, and fundraising with the proceeds. Since DD was away at Oxbow in the Fall, she didn’t get started until January. She was told that there had to be minimum 8 outfits to participate, not 3 like she did last year. Panicked, we decided that the only way to get thru the project was to use commercial patterns, as last year all of her patterns were created for each of her 3 garments. Since her sewing skills are limited I promised to be her samplemaker when I could. I promised myself not to influence. 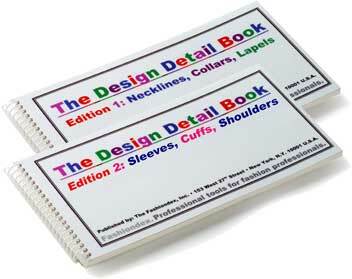 It’s her designs and fabric choices, I have just been expediting. It’s been crazy since January as we try to move forward on her 8 ensembles. 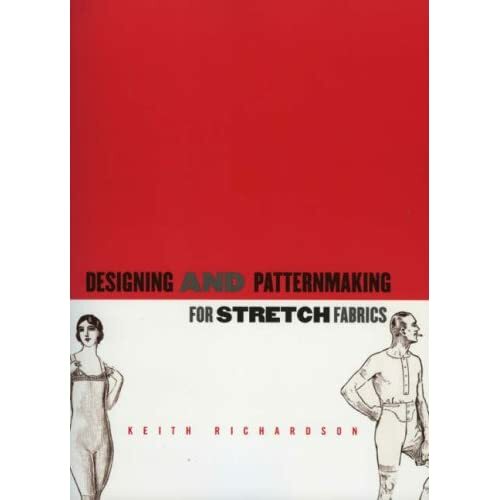 We combed the pattern boxes to try to match her sketches to existing patterns, and shopped the stash for 97% of the fabrics she picked. Other than buying a few buttons and trims, she managed to find everything in the studio here. That’s the advantage of having a stash the size of Rhode Island. As she told her designing friends at school “My mom collects fabric like other people collect action figures”. The show is next week, but I thought you might like a preview of one of the styles. 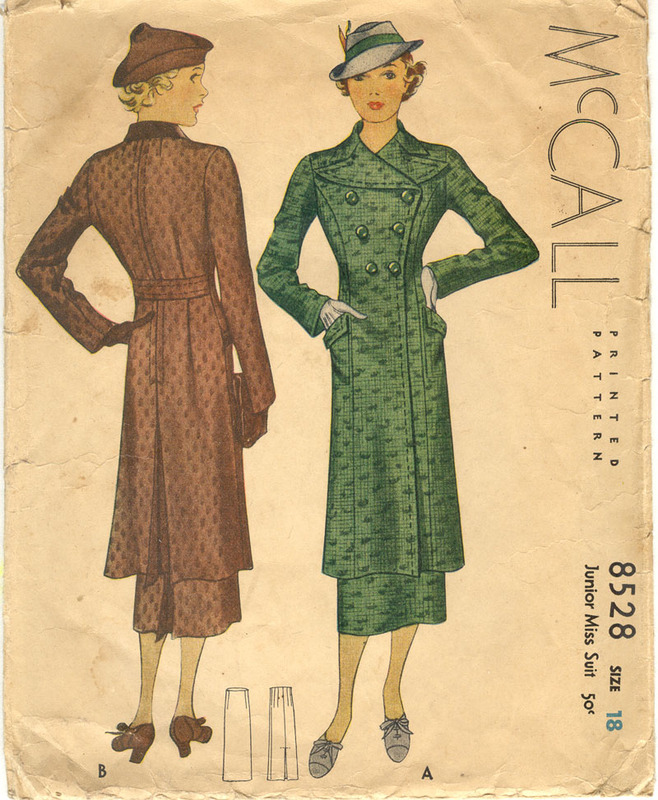 It’s based on this pattern from 1935. Check out the back We didnt use the exact pattern, as the center of the back pattern had been cut away. The fabric is older than DD, an ignoble poly taffeta that loves to pucker. I have to say that I have never attempted to make anything like it. A high peaked double breasted lapel? Never! But it did come out OK, and I credit the excellent though sparse instruction included in the pattern. I will post pics from the show after next week. We are all excited to see how it all comes together, with elbow gloves and a big hat off of eBay and belts and jewelry from local thrift shops. Here’s the envelope back for your delectation. Believe it or not – I made a muslin. Not so much for fit, but more for proportion. 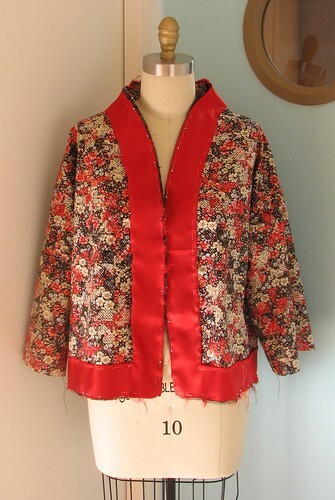 Loose styles can be overwhelming so I had be sure this jacket didn’t hang like a sack. This simple style has come nice dtails. I like the way the collar stands away from the body and frames the neck, and the length is high hip. The dropped shoulder was taken up 1/2 inch, and I raised the armhole a bit as well because the muslin was binding across my back. 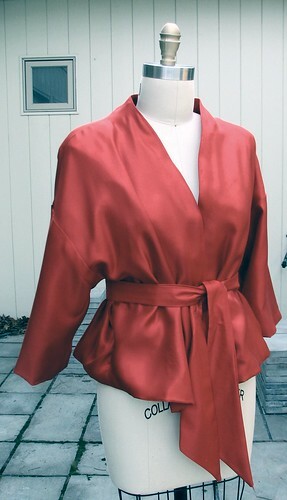 One thing I have to modify is the construction to make the jacket reversible. 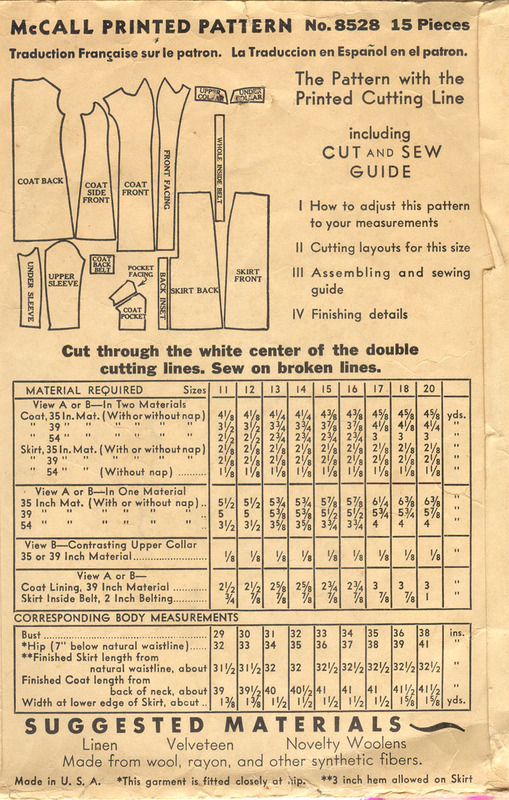 In the original instructions, the facings are on the inside, and the edges are folded under, pressed, and then stitched down. I’ve moved the facings to the right side, and I really didn’t want to manually fold down the edges all the way around the jacket. Another thing to factor in was interfacing; a fusible was just tad too stiff, so I used silk organza and the Balloon Applique technique from my holiday dress. 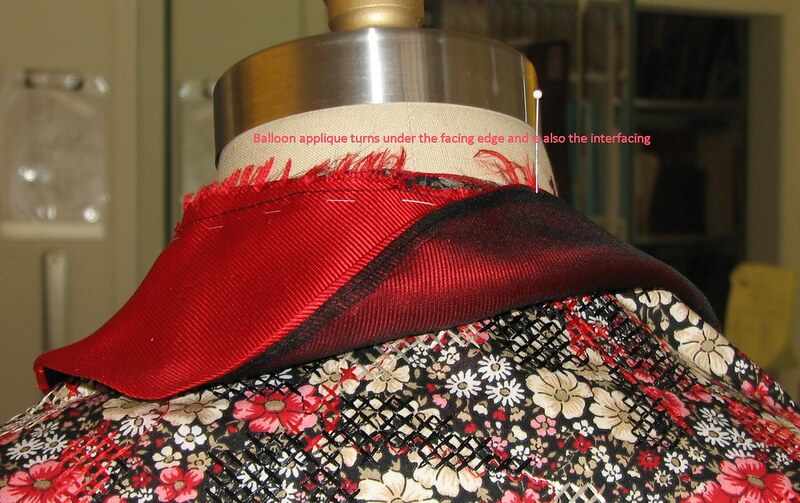 The black silk organza also acts as a soft interfacing, and I will hand fell stitch the facings to the fashion fabric. 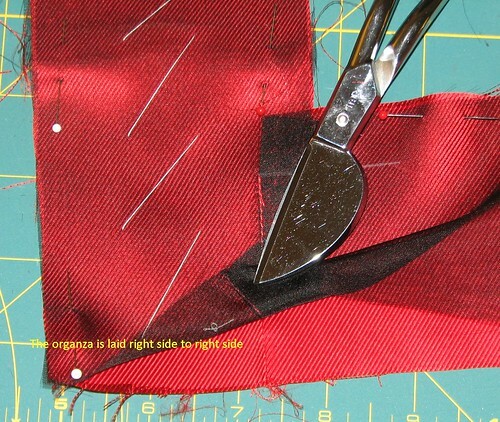 This fabric requires a lot of basting; it ravels, snags and pulls easily,and after reading Marji’s blog I think it might even be necktie silk – she’s using a similiar fabric for her latest jacket.. 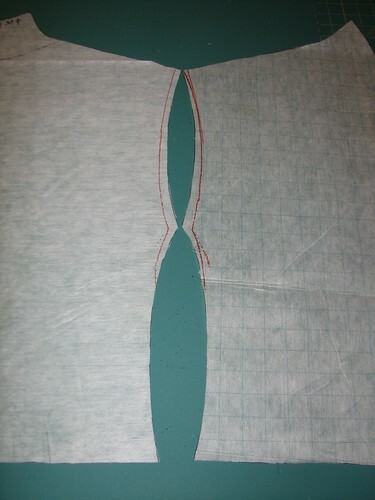 In the full length view above the outer edge of the facing is machine basted, and the inner edge will be hand fell stitched to the fashion fabric. There’s no lining yet. I need to attach the facing and then I can line it. The sewing is going fast; the hand finishing will take more time.